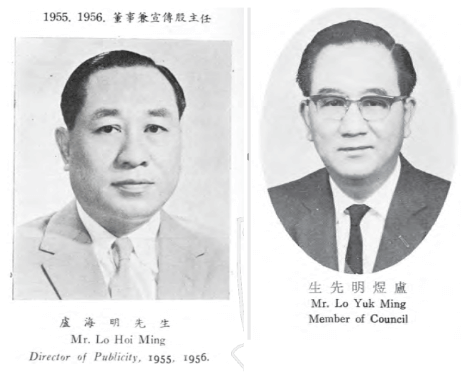 In the 1950s and 1960s,Lo Hoi-ming (盧海明) and his younger brother Lo Yuk-ming (盧煜明) were key figures in the HK real estate and construction industry whose Nam Sang Building Construction Co developed many buildings in Hong Kong island on its own and in partnership with other developers, most notably Cheung Chan-hon of Cheong Lee Construction (to be covered). Born in 1906, Lo Hoi-ming was a native of Enping in Guangdong province and started his career in HK as a staff member of the architectural firm of Weaser& Raven in HK. He later became a draftsman at Chau & Lee (named after its partners Chau Iu-nin and Richard Edmund Lee), which was the most famous Chinese architectural practice from the 1930s. After the War, he started Nam Sang Building Construction Co (although as a company it was not incorporated until 1961) and Hung Kin Engineering Design Co (鴻建工程設計公司) in HK. Both brothers served on the board of the HK Building Contractors Association (HKBCA) in the 1950s. 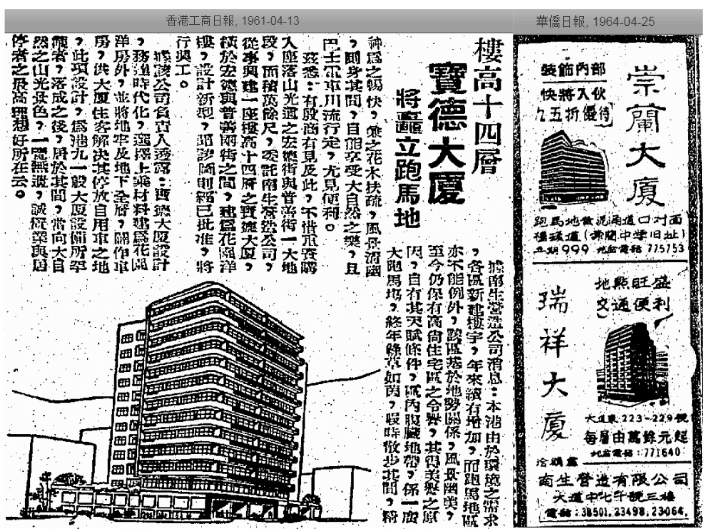 The change of regime in the mainland in 1949 resulted in massive influx of refugees into Hong Kong and to meet the demand for short term housing, Lo acquired the former site of the Hong Kong Daily Press (孖剌西報) in Wanchai and built the 9-story Hennessy Hotel (軒尼詩酒店),which opened in February 1951. He operated the hotel for a decade and was even elected chairman of HK Guest House Merchants Association (旅業商會)in 1959. On its own, Nam Sang Building Construction also developed at least three properties in the early 1960s in Hong Kong Island East – the 14-story Po Tak Mansion (寶德大廈) at 3A-3E Wang Tak Street in Happy Valley, the Sung Lan Mansion (崇蘭大廈)at 37 Leighton Road which was built on the former site of the Buddhist-run Sung Lan Middle School and Shui Cheung Building (瑞祥大廈)located at 223-229A Queen’s Road East in Wanchai. In 1962, the Lo brothers decided to demolish the Hennessy Hotel in Wanchai as they figured it was more lucrative to re-develop the site into a high-rise building than operating it as a hotel. Teaming up with their usual partner Cheung Chun-hon, who brought in his fellow clansman – the Thai Chinese liquor baron SupasitMahaguna (張卓如), the proprietor of Mahaguna Distillery and Bangkok Metropolitan Bank, they formed Thai Kong Enterprise Co Ltd (泰港企業, as in Thailand and Hong Kong representing the domiciles of the developers involved) and built Thai Kong Building (泰港大廈) at 480-482 Hennessy Road in 1963. In partnership with Ming Fat Land Investment Co Ltd and Tai Hing Hong, Nam Sang developed Sung Wah Mansion () at 28-30 Bonham Road in the Mid-Levels in 1963. This was a higher end project for the firm as the starting price for each flat was HK$50000, which was significantly higher than the starting price of HK$10000 for a flat at Cheong Ip Building, Nam Sang’s other project at the same time. 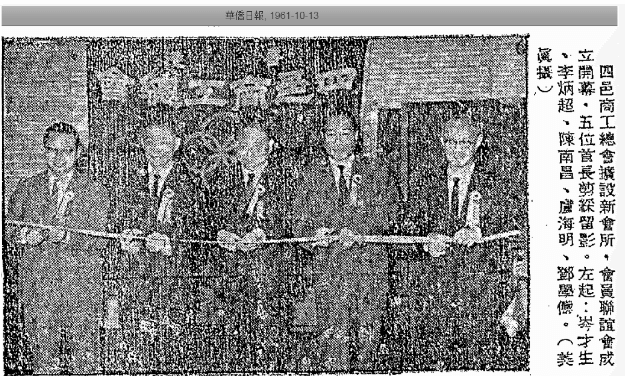 In 1964, Nam Sang teamed up with Cheong Lee, Hip Shing Hong (controlled by Fong Shu-chuen and his family), Ming Chuen Construction (the joint venture between Kwan Kai-ming and Chui Yu-chuen, see article on Kiu Fung Investment) and Demig Trading (importer of construction materials controlled by Cheng Yam-yue, the brother in law of Sir Kenneth Fung) to develop Yip Fung Building at 2-12 D’Aguilar Street in Central right behind the King’s Theatre (now Entertainment Building). Outside of work, Lo Hoi-ming was very active in community affairs in the 1950s and 1960s having served as director of the Tung Wah Group of Hospitals in 1958, vice chairman of the Yan Ping Industrial & Commercial Association (恩平工商總會) and supervisor of the Yan Ping Association (恩平同鄉會) and the Sze Yap Commercial & Industrial Association (四邑商工總會). In 1963, Lo Hoi-ming’s eldest sonLo Kwan-sing (盧鈞成) returned to HK to join Nam Sang after earning his M.S. degree in civil engineering from University of Birmingham in the UK and B.S. in civil engineering from Ohio State in the US. Kwan-shing’s younger brother Wai-lam and the three children of Lo Yuk-ming – Shing-Cho, Shing-chiu and Suk-yin also studied in the US. In 1964, the Lo brothers through Mee Cheong Investment(incorporated in 1963, dissolved in 1990) was planning to develop the site located at 141-145 Portland Street in Mongkok and hired Nam Sang as the contractor. 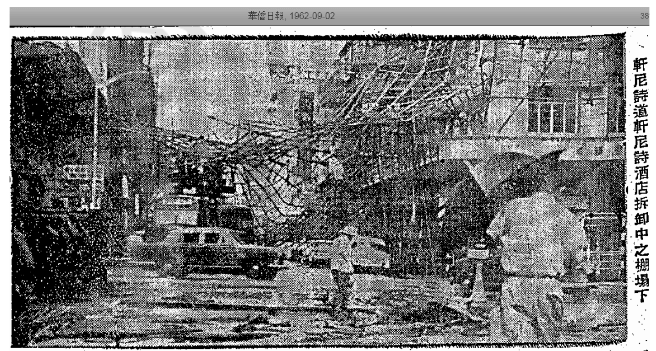 While the building was almost complete by 1967, the HK property market was in a free fall thanks to the banking crisis in 1965, the Star Ferry riots in 1966 and leftist riots in 1967. 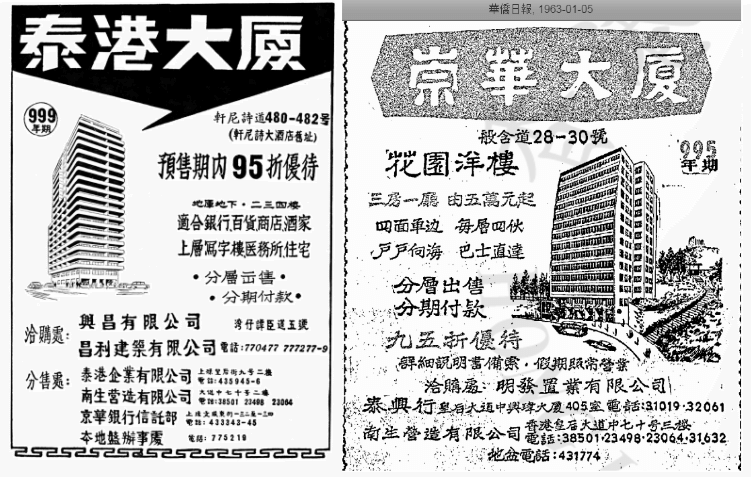 Lo Hoi-ming fled to Taiwan and Hang Seng Bank foreclosed on the property in 1968 and completed the building as Mee Cheong Building (美昌大廈).Little info is available about the Lo brothers after that and as a firm, Nam Sang Building Construction dissolved in 2017. This article was first posted on 22nd February 2019. 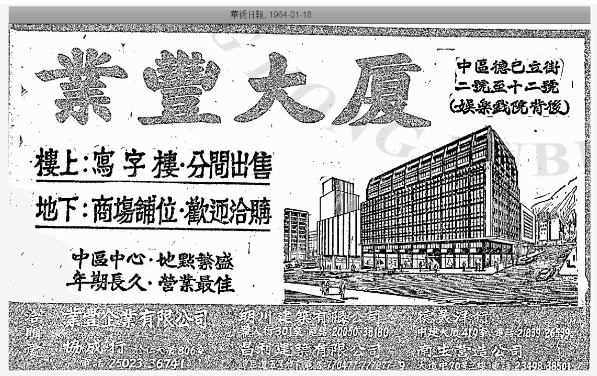 According to a 1969 directory, the Lo brothers and architect Chau Iu-nin (Lo Hoi-ming’s former boss) also formed Tsing Chau Brick Factory (青洲磚業) in 1960 which had its office at 70 Queen’s Road Central and factory in Ho Sheung Heung in Sheung Shui in the New Territories. Chau was chairman of the firm while Lo Hoi-ming was managing director.